The Pro Evolution Soccer series used to be top dog until it was supplanted by the flashier, better licensed FIFA games. Today, PES suffered another blow, with publisher Konami announcing the German club Borussia Dortmund terminated its licensing agreement a year ahead of schedule, meaning the top-tier Bundesliga team will not be appearing in PES 2019 as previously advertised. 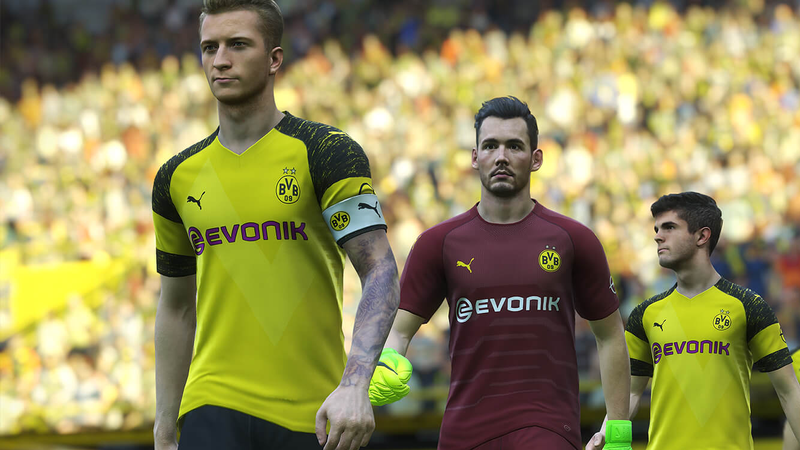 “Borussia Dortmund was included in some of the promotional assets of ‘PRO EVOLUTION SOCCER 2019,’” Konami wrote in an announcement on its website. “Please note however that it can unfortunately not be included in the product.” That’s because Dortmund “prematurely” terminated its licensing agreement with Konami ahead of its June 2020 expiration date. As a result, none of Dortmund’s logos, players, or other features associated with the team, as well as its stadium, will appear in this year’s PES installment. Kotaku did not immediately hear back from either Konami or Dortmund as to why the agreement ended so unexpectedly. The series has continued to suffer in terms of securing high profile licensing deals in recent years. If you want to play as well-known teams like Manchester City or Manchester United, FIFA has been the only game in town. In PES 2018, both those Premier League clubs were included as generic “Man Blue” and “Man Red” sides. The game infamously lets players import their own jersey designs and customized rosters so they can paper over the licensing holes themselves. But while PES 2018 didn’t have licenses for major leagues, it did have deals with individual teams, most notably Liverpool and Dortmund. What makes Dortmund extra special these days, at least for American fans, is its rising midfield star Christian Pulisic. One of the best new players to appear in a U.S. Men’s National Team jersey in a generation, Pulisic was a lone sign of hope to emerge from the country’s otherwise embarrassingly failed World Cup bid. Despite that setback, the fact that he’s continued to impress at one of Germany’s better clubs was a reason for U.S. soccer fans to hang their heads ever so slightly less low and a great get for PES, a game which usually manages to outperform FIFA when it comes to moment-to-moment play. Konami’s challenges with PES 2019 are best summed up by the appearance of David Beckham, who hasn’t kicked a ball in an official match since 2013, on this year’s cover. However, the bumblebee black and yellow of Dortmund noted elsewhere remained a bright spot. Now that too has been snuffed out. Oh well.